Still, Reid added: “Trump is an interesting person. He is not immoral but is amoral. Amoral is when you shoot someone in the head, it doesn’t make a difference. 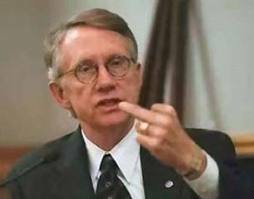 No conscience.” There was a hint of grudging respect in Reid’s tone, which he seemed to catch and correct. “I think he is without question the worst president we’ve ever had,” he said. “We’ve had some bad ones, and there’s not even a close second to him.” He added: “He’ll lie. He’ll cheat. You can’t reason with him.” Once more, a hint of wonder crept into his voice, as if he was describing a rogue beast on the loose in a jungle that Reid knows well. The Trump era and Reid’s illness have occasioned an inevitable reconsideration of Reid’s legacy and all its contradictions. The Affordable Care Act, which Reid managed to navigate past the oppositional tactics of his persistent nemesis, the Republican Senate leader (and now majority leader), Mitch McConnell, has so far withstood McConnell and Trump’s efforts to dismantle the legislation. Reid was also prescient in urging the Obama administration and congressional Republicans to go public about the investigation into Russian meddling in the 2016 election; the letter that Republican leaders agreed to co-sign weeks after they were briefed on the investigation did not identify Russia by name. “They did nothing — or nothing that I’m aware of,” Reid said. Reid’s successor is Chuck Schumer, his former caucus deputy who engineered much of the Senate Democrats’ communications and campaign strategy during Reid’s tenure. They had been close during Reid’s 12 years as Democratic leader, Reid serving as the arid desert yin to Schumer’s bombastic Brooklyn yang. When we spoke, Reid told me he did not wish to be seen as second-guessing Schumer. “My personal feeling should have nothing to do with it,” he said. But clearly Reid has more than a few of those personal feelings. He has told confidants that he felt Schumer was too eager to assume his job before Reid was ready to leave. Reid has also criticized, privately, Schumer’s instinct for accommodation with both McConnell and Trump. Ooh, thats harsh. But true. Schumer is a weak point for a lot of reasons. So are his followers. Thank the right wing media for that.